Every winter, bad weather — snow, slush, freezing temperatures or even heavy rains in warmer climates — can present challenges to getting children to school. So do the colds, fevers and earaches that often come with the winter months. 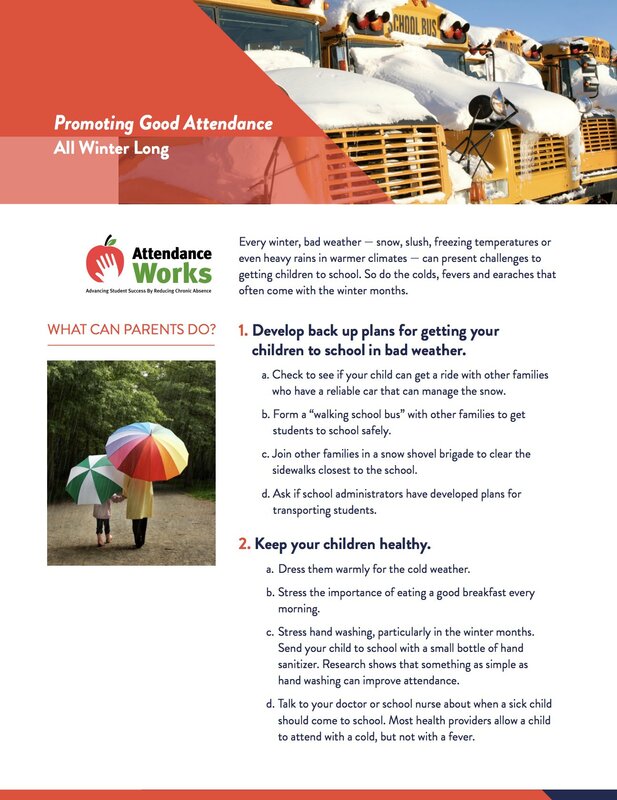 These tough, but common winter conditions mean it is even more important to remind parents about the importance of good attendance so they are motivated to make every effort to get their children to school despite the challenges! Absences, even if they are excused, can add up to academic trouble. The tools and resources in this winter messaging toolkit (on this page, below) can help parents and community members develop strategies and plans to overcome weather-related barriers that stand in the way of getting children to school. While such extra steps are important for all families, they are even more important for low-income students who are more likely to depend on public transit or walking to get to school, both of which can be easily disrupted in bad weather. These same students are less likely to have access to good health care, making them more susceptible to colds and other ailments. Attendance Works expresses our heartfelt thanks to our good friends at Abriendo Puertas for translating the materials into Spanish.